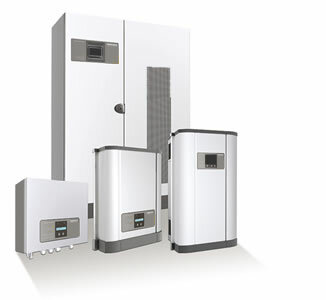 The solar inverter converts the direct current generated by the solar modules into grid suitable alternating current. PLEXON SOLAR cares for the supply of solar inverters and chooses for each application the right device from the right manufacturer with the appropriate efficiency. Inverters for all types of modules, grid-tied and off-grid models, for small residential installations as well as for use in large PV power stations and open-field plants. For observation solar inverters are available with remote monitoring systems and data transfer, wireless or Internet-based. We only recommend and use devices from renowned manufacturers with quality warranty and which are tested according to strictest standards. String and central inverters with highest efficiency for maximum power output and convenient operation.